Is it mere coincidence that after U.S. President Donald #Trump‘s visit, GRP President #Duterte declared the CPP-NPA as terrorists, cancelled the peace talks with the NDFP, and threatened to launch a crackdown on legal progressive groups or so-called communist fronts? We think not. In history, the imperialist U.S. government is known for installing and/or supporting fascist regimes (Pinochet in Chile, Marcos in the Philippines). After their bilateral meeting, Duterte is now set for a no-holds-barred fascist rule in the country. Duterte is determined to arrogate the power of removing critics in his administration and to suppress all forms of dissent and resistance. Resist the anti-people and fascist rule of US-Duterte! Lumad students and teachers camped outside DepEd Central Office as they demand the agency to rescind DepEd Memorandum Order No. 221, to grant Lumad schools permits to operate, and to issue a condemnation of the attacks on schools perpetrated by state forces. Farmers from Southern Mindanao travelled thousands of kilometers and camped outside DAR Central Office as they demand DAR to give them their long-overdue land installation orders. Evicted urban poor from Floodway, Pasig City camped outside Malacañang to demand housing and livelihood. These campouts speak a lot about how inutile and anti-people the Duterte administration is. 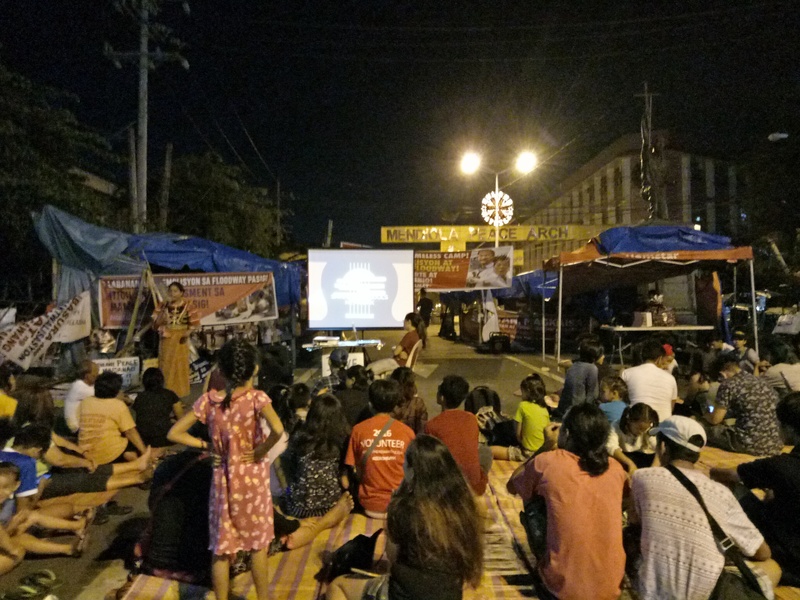 Earlier tonight, urban poor group Balikwas Kadamay and Lumad group Save Our Schools Network held a cultural program at the doorstep of Duterte’s Malacañang. We can’t help but realize the common denominator among their plights: internal displacement. In the countryside, the Lumad are being driven away from their ancestral domain to allow the entry of foreign mining companies, agri-corporations, and plantations. In the cities, urban poor houses are being demolished to give way for malls, condominiums, and other business interests. This November, different progressive sector groups held a week-long protest during the ASEAN and East Asia Summits where leaders of global superpowers discuss how to further penetrate captive markets, plunder natural resources, and exploit workers through cheap labor and slave-like working conditions. Consequently, Duterte ordered concerned government agencies and the Congress to fast-track the removal of foreign investment restrictions, which would require legislation. The push for all-out liberalization will result in more demolitions, land-grabbing, and militarization, both in the urban and countryside. Cases of human rights violations will increase as the state employs the police and military to protect business interests. It is not just ironic but unjust that the urban poor and indigenous peoples have no place to go while the government seeks to allow 100% foreign ownership. Maybe at some point in their lives, they have asked where is their place in this country. We say that their place (and our place) is in the struggle. In the struggle for land, decent housing, regular domestic jobs, and living wage. In the struggle against imperialist plunder, for national and economic sovereignty.